Franklin County food inspection reports are available online. There is no grade assigned to the reports, but the complete inspection reports are posted to allow the public to conveniently view all violations and comments that were noted during inspection. We have also utilize a sign program that allows restaurants and other businesses we inspect, such as groceries and convenience stores, to inform customers they have been inspected by Franklin County Public Health and let them know the inspection report is available online. The sign program is a voluntary program. The food service and retail food establishment operators are not required to display an inspection sign, but they will be offered the sign after the completion of an inspection. However, regardless of the operator’s decision to post the inspection sign, their inspection reports will be available online. This is an unannounced inspection. All areas of the facility will be inspected to ensure compliance with regulations. Risk Level 1 has very limited food handling or preparation. The business may provide things such as pre-packaged food or fountain drinks. Risk Level 2 may involve more employee food handling, but the type of food handling still constitutes a lower risk than a business that prepares a variety of food. Risk Level 3 involves a higher risk because of concerns for proper cooking procedures, proper holding temperatures, and processing raw food products. Risk Level 4 involves the greatest risk because it may involve serving raw, ready-to-eat potentially hazardous food; serving food to a primarily high-risk clientele, or preparing food which requires multiple temperature controls to preclude bacterial growth. This type of inspection is conducted in a level 4 food service operation. It focuses on tracking all potentially hazardous food items from arrival to consumption. This inspection is conducted in a level 4 retail food establishment to determine that all procedures are being conducted according to Chapter 3717 of the Ohio Administrative Code. This is an inspection conducted as a result of a complaint received by Franklin County Public Health. The complaint will be investigated and the results of the inspection and investigation will be discussed with the operator of the facility. These are violations that if left uncorrected, are more likely to contribute to foodborne illness. Examples of critical violations include improper cooking temperatures and improper holding temperatures. These are violations that are not directly related to the cause of foodborne illness. Examples of non-critical violations include maintenance and cleaning issues. These are foods which require temperature control. This includes meats that are raw or cooked, cooked vegetables, raw seed sprouts; or cut melons. All TCS food must be held at 41 °F or below or at 135 Degrees Fahrenheit or above. The area between is often referred to as the “Danger Zone”. This is the temperature range that allows certain bacteria to multiply rapidly. Food items that are ready-to-eat are items that do not require washing, cooking. 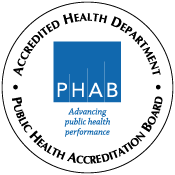 Franklin County Public Health (FCPH) announces a recognition and award program for high-performing food service operations and retail food establishments. This new Gold Medal Award Program will recognize operations that consistently perform exceptionally well throughout the licensing year. Operations that finish the year with no critical or non-critical violations identified during routine inspections will qualify for the Gold Medal Award. Operations that meet the qualifying criteria and are selected as a Gold Medal Award winner will receive a decal that can be placed in a conspicuous location within the operation. This decal will emphasize customer satisfaction and promote the operator’s commitment to safe food handling and emphasis on customer satisfaction. The main goal of this new program is to increase food handler awareness of food safety principles and help motivate the operators to place more emphasis on proper food handling practices. 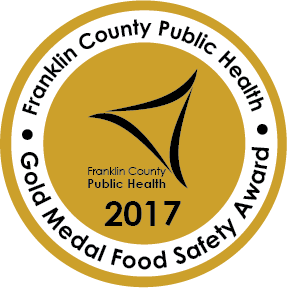 The Ohio Uniform Food Code, general food safety information and an example of the Gold Medal Award decal are included in the Food Safety Program portion of our website. If you have any questions about this program, please contact the Food Safety Program Supervisor, Garrett Guillozet, at (614) 525-4537. 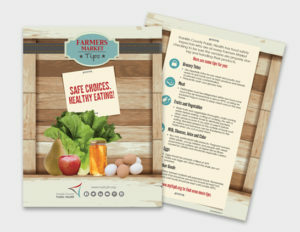 Shopping at farmers markets is a great way to eat healthier and local but just as with any restaurant, grocery store or even in your own home, there are proper ways to handle products so you and your family don't get a foodborne illness. Click on the image for the PDF version.